Decorate from floor to ceiling with some fun party supplies when your family celebrates Easter this year. With the Arcade Tissue Garland, your ideas are endless. Use it to create a border around the fireplace, wrap up the banister, or even hang in each doorway for a unique entrance. 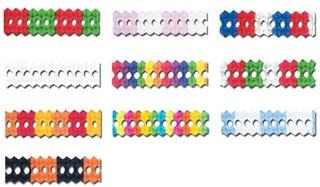 There are assorted colors and patterns to choose from in the Arcade Tissue Garland.